The theme for Earth Day 2018 is ‘End Plastic Pollution’, something the kids and I have been talking about a lot lately. Inspired by everything we have been learning, one of the things we really wanted to do was to make our arts and crafts more eco friendly. Among other things, that means finding replacements for some of our favourite arts and crafts resources. Top of that list is glitter. eco glitter – no plastic in these sparkles! Yep, glitter. Conventional glitter is made up of hundreds and thousands of teeny-tiny bits of plastic. As it’s so small, it is classified as a micro plastic and can cause terrible harm to the environment. Luckily, there is an alternative to plastic glitter. Made of plant cellulose, Eco Glitter Fun’s eco glitter is biodegradable, non-toxic, and generally earth-and-ocean friendly. And with all that, eco glitter is still just as sparkly as the plastic stuff. Yay! As we had been talking about how micro plastics pollute the ocean, we decided to use our eco glitter to make some sparkly fishes. Lino printing is a favourite activity in our house, so we decided to print the fish rather than draw or paint them – and this seemed like a good time to introduce the kids to the technique of printing a colour graduation or blend (where two colours blend in the middle to make a third). We decided to print our fish a blend of blue to green (with a touch of yellow) – suitably oceanic colours that went well with the colours of our eco glitter. Lino printing with two or more colour, rolled out together to create a graduation of colour. We used some linocut fish blocks that I had already carved for this project – I have done carving with the kids, but this time it was all about the printing and finishing, so it was easier and quicker to have a block ready for them to use. I did this lino printing activity with a group at T-Bird’s nursery, but was so busy helping the kids with their printing that this is about the only photo I got… oops! When we were ready to start, we set up our lino printing area in the way that I’ve taught them – all our supplies in a row; starting with the ink plate and roller, next to that a space for inking up the block, and finally our ‘clean’ space for printing our image onto paper. Rolling out the ink is such a satisfying process. The kids squeezed three dots of ink in a row onto our ink plate – blue, green and then just a tiny bit of yellow, chosen to match our eco glitter. With a printing roller, or brayer, they then rolled out the ink (using repeated strokes all in the same direction), and then applied the ink to the lino block. Once the lino block is inked, we carefully move it to our printing area and place a piece of paper on top. Laying the paper onto the block and carefully pressing down. After pressing the paper down with their fingers, the kids use a baren (a Japanese tool for printing that’s essentially just a round disc, wrapped in bamboo – but a wooden spoon works just as well) to rub over the block, transferring the image to the paper. Then it’s time to peel back the paper and see what they’ve made! Usually that would be it, but we wanted to try out our new eco glitter and make our fish sparkle! So the kids added a little sprinkle of the eco glitter over the wet ink in colours of blue, green, silver and rose gold. The colours complimented the ink really well, and caught the light beautifully. Lots of oohing and aahing from the kids! A little sprinkle of eco glitter on our Earth Day lino print fish! 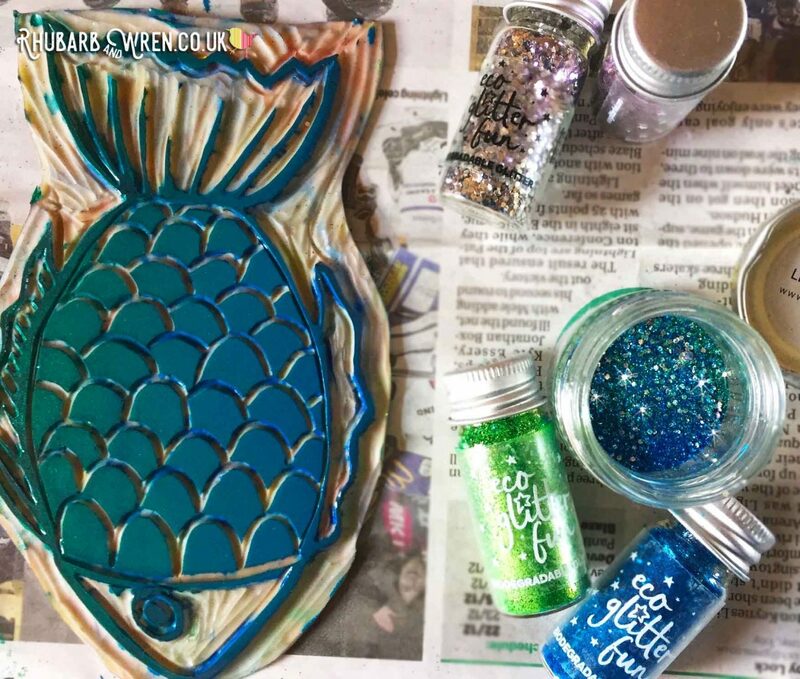 Making our glittery fish was a great opportunity to practice different art techniques with the kids while also talking about the issues of plastic pollution, and the effects on life in the ocean, as well as the environment in general. This special glitter is precious, so we save the loose bits to use another day. 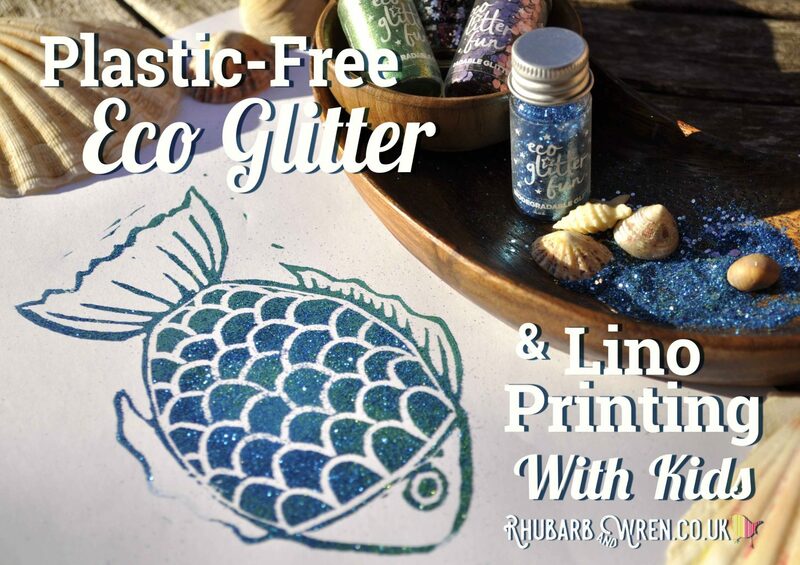 We were able to talk about all this in the positive context of making art using non-toxic, water-based printing inks that don’t require any nasty chemicals to clean up with, and, of course, using our lovely non-plastic eco glitter. By the end of our session, even four-year-old T-Bird had an understanding of the basic issue, and has become an enthusiastic convert to the plastic-free cause! The eco glitter on our lino print fish glitters beautifully in the sun. We found the eco glitter felt much softer than the ordinary, plastic, craft glitter we’re used to, and as it’s cosmetic grade, it can be used on the skin in face-paints or make-up, as well as things like soap and bath bombs, where that softness would definitely be an advantage. For us, what mattered was that it still has a lovely shimmer and sparkle, just like our old glitter – I don’t think you’d really see much difference. The four glitters each had particles of different sizes – the silver and rose were very chunky, while the blue was a standard size and the green a very, very fine glitter dust! Eco Glitter Fun actually stock five different sizes of glitters, and the combined effect was really striking – that variety adds a lot of interest and texture when you use a few together. This eco glitter comes in little glass bottles, packaged carefully in paper and card. 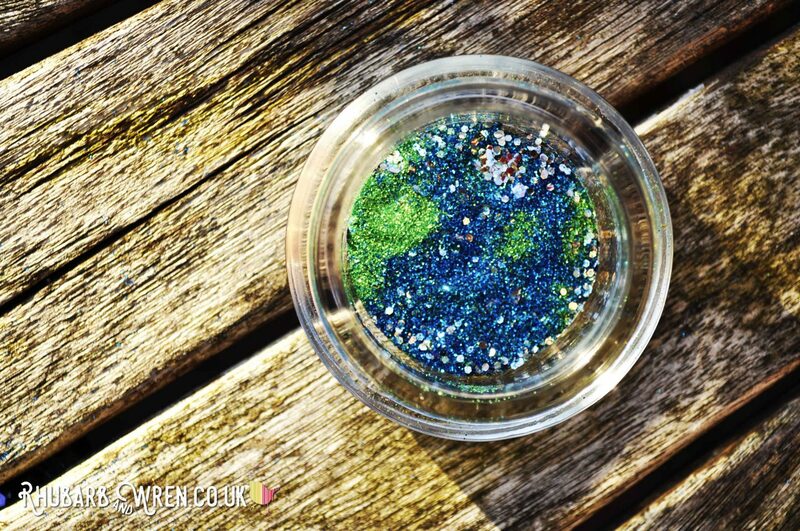 We were very kindly sent our eco glitter by Eco Glitter Fun for the purpose of this article, but if you want to buy it, their eco glitter prices start at £4 for a 3.5g bottle, with free shipping in the UK. It’s obviously pricier than the plastic variety, but I was really impressed with how far the eco glitter stuff goes – we seemed to barely make a dent in our supply even with some fairly liberal fish glittering! These sparkly ocean shades are just right for a fish picture. Glitter is wonderful to look at, and little kids do tend to love it, so I can understand why people might be reluctant to switch to a pricier alternative that might mean using less. Personally, it came down to making a conscious choice to change how we use glitter in our arts and crafts activities. Now, instead of being something fun that we sprinkle liberally over everything or anything, glitter has become more precious and special – and thinking about it this way makes anything we do use it for that bit more precious and special too. Having made this change, I’ve found that rather than complaining or asking for more, the kids have embraced the idea and are putting noticeably more thought into when, where, and how we use our eco glitter supply. I think the art they make is all the better for it, and I know the planet certainly is! You can order Eco Glitter Fun’s biodegradable glitter from their website – www.ecoglitterfun.com. They have a whole rainbow of colours in different grades (or sizes) of glitter, all packaged with as little plastic as possible. There’s lots of information about the eco credentials of their product on the website too, so check it out for lots of helpful (and reassuring!) information. Want to try linoprinting? You’ll need a few basic supplies! For detailed advice on what to buy, with a list and handy Amazon links, check out my other article: Linocut Project – Harry Potter’s Firebolt. But if you’re just looking for a quick start, then my top recommendation for a kit that contains everything you need to get going at the best possible price is the (affiliate link) Essdee Lino Cutting and Printing Set. Craft, Eco Glitter Fun, Kid-Made, Learning Through Play, Linocut, Parenting Without Plastic, Plastic Free, Printing. Bookmark. what a great idea, I am going to see about getting some. I had not even considered the effect glitter would have on the environment. this has brought me great awareness and I love the craft ideas! We absolutely LOVE this article! Thank you for sharing you glittery fish with us ! Thank you for sharing your glitter – we had a blast!